Helps you to prepare meeting agendas, to write useful meeting minutes and to track the results of meetings. 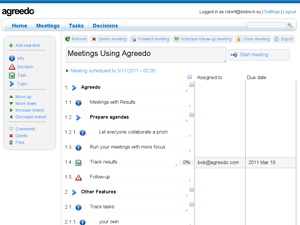 AgreeDo helps you to prepare meeting agendas, to write useful meeting minutes and to track the results of meetings. Agreedo captures all relevant information in meetings, like tasks, decisions, or important issues, and sends them to all relevant participants. The trick to avoid annoying or boring meetings is to prepare them and to collaborate on the agenda before the meeting starts. Agreedo helps you doing that. You can prepare your next meeting agenda with Agreedo and share it with all attendees. In the next step, you use this agenda to put down the meeting results and assign tasks. Finally, you use Agreedo to either follow-up on tasks or create a follow-up meeting by transferring your meeting minutes to the new meeting. It's very simple. And that's why it's very effective. It does not sound huge, but when you use it, you will get addicted. Briefly, Agreedo lets you prepare your next meeting. For free. In 2 minutes. It's as easy as writing an outlook invitation. Try it at AgreeDo or watch the demo video. Agreedo unlocks the great idea saving time by preparing and structuring meeting contents. All attendees already collaborate on the meeting before the meeting starts. A real time saver. The de facto online diagramming tool which allows you to visually communicate, collaborate, and share ideas. Create your virtual business card, collect all your contacts in one place and create a portfolio. Simple project management, real-time collaboration, CRM, Intranet - do it all in one place.